The White Tower of Minas Tirith. The Tower of Ecthelion is 50 fathoms (300 feet) tall. The plain white standard of the Stewards of Gondor flows from its pinnacle. The Tower stands in the center of the Citadel on the seventh level of the city. 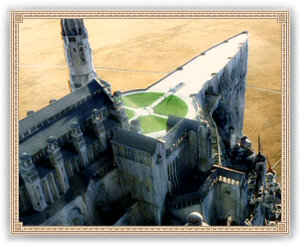 In front of the Tower is the Court of the Fountain where the White Tree of Gondor grew.